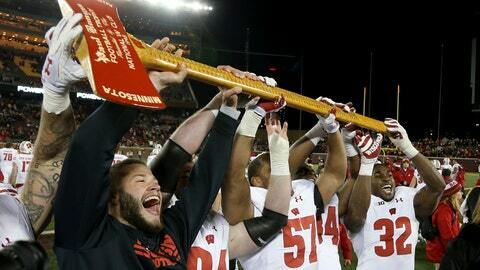 MADISON, Wis. (AP) — Barry Alvarez was pacing the sideline as coach the last time that Wisconsin lost Paul Bunyan’s Axe to Minnesota. It’s all the education that younger fans and players need to understand why rivalry games remain important in the Big Ten. The Midwest grudge match between Minnesota and Wisconsin may not resonate nationally, especially in years when the Gophers or Badgers aren’t in the Big Ten title chase. But it’s a border scrum that always draws regional interest, no matter the records. The teams meet for the 128th time on Saturday, the most-played rivalry in major college football going all the way back to 1890. Axe Week preparation for the Badgers includes playing a video in the locker room on an endless loop of the Badgers’ victory celebrations. Wisconsin has won 14 straight in the series. Maybe it helps that the Badgers and Gophers have been geographic rivals for so long. A unique trophy axe and a ceremonial victory celebration in which the winner “chops” down the goal posts add to the allure. At Nebraska, athletic director Bill Moos said he thinks that rivalry games don’t resonate as much with younger fans because the postseason stakes aren’t as high as decades ago. Moos, who became AD in October 2017, is trying to build a rivalry with Iowa, the Cornhuskers’ opponent in their “Black Friday” game. Oklahoma and Colorado were Nebraska’s opponents for the day-after-Thanksgiving game while in the Big 12. Now Nebraska will play Iowa on Black Friday for the eighth straight year. Some rivalries have fallen by the wayside, Moos noted, like Texas-Texas A&M and Nebraska-Oklahoma. Other longstanding matchups remain as strong as ever. The Big Ten’s biggest rivalry — The Game between Michigan and Ohio State — always draws attention because at least one team is almost always in the conversation for a league title or more. The Purdue-Indiana rivalry for the Old Oaken Bucket this year has unique stakes in the Hoosier State showdown. The five-win teams need one more victory to become bowl eligible. If the Gophers (5-6) pull an upset at Camp Randall Stadium, they get the bonus of becoming bowl eligible, too. But starting in 2020, Iowa will replace Minnesota as the final game on Wisconsin’s schedule for a two-year stint, with the Axe game being moved to early October. Alvarez doesn’t mind the move because he views Minnesota as a strong rival. He thinks fans will come no matter when or where the game is played. “You like to think they are,” Alvarez said when asked about the importance of rivalry games from a marketing perspective for an athletic department.